I have been keeping my eye on the net book environment for quite some time. I love the idea of a smaller foot print, but want the computer to be usable. I was at Best Buy (looking for something else) when I thought I found the LT3103u Gateway Net Book. The moment I put my hands on the keyboard I knew this net book was different. The LT3103u is was larger, 1.03’’(H) x 11.26’’(W) x 7.99’’(D), than all the other net books on the shelf while still be extremely portable. This extra size does not go to waste. The LT3103u sports a 11.6 inch display and a keyboard that fits my full-sized hands! All other net books that I have looked at to date (too numerous to enumerate) have failed the keyboard test. Contorting my hands to fit a keyboard is not an option. The LT3103u once again sets itself apart from your typical net book by shipping with an AMD Athlon L110 64 bit processor and ATI Radeon X1270 Graphics. These two combine to provide processing power and performance. The LT3103u has 2GB of RAM and a 250GB hard drive. One aspect the LT3103u could have done better was shipping with a 64bit OS. Instead you get VISTA Home Basic 32 bit. For me this is not a big issue because the first thing I did was install Windows 7 on the machine. I was a little tight on time for the installation so I opted to upgrade to Win7 32bit knowing that the 32bit drivers were already on the machine. The Win7 32bit upgrade went without a hitch. At some point, I want to install Win7 64 bit. Below is the Windows 7 “Windows Experience Index”. I was expecting a bit more from the AMD. Maybe the 64bit version will fair better. This rating is enough to allow the LT3103u to support all the Aero features of Windows 7. The LT3103u ships with a 6 cell Li-ion battery pack. I have been getting around 4 hours of battery life. This is an acceptable amount as it gets me between times where I am un-plugged. I bought the LT3103u at Best Buy for $399. I just visited their website and it looks like you can now get it for $379. This is in the upper net book range but still well below a typical notebook. OS Windows Vista Home Basic 32 bit FAIL – Really? 64 bit processor, but only a 32 bit version of Windows? Not a show-stopper though, because I intend on installing Win7. Memory 2 GB WIN – Already equipped with the minimum that I would need. Storage 250 GB HDD WIN – Nice size. Network 10/100 Ethernet WIN – Must have. WLAN 802.11 b/g WIN / FAIL – What? No wireless ‘n’ support? Bluetooth No WIN / FAIL – I don’t currently have any Bluetooth enabled devices, but I don’t have a Bluetooth enabled computer…catch 22! Dimensions 1.03’’(H) x 11.26’’(W) x 7.99’’(D) WIN – A bit bigger than your standard net book, but still portable. Webcam Gateway Webcam WIN – Built in non-obtrusive 0.3 Megapixel. Battery 6 cell Li-ion Battery Pack WIN – Up to 5 hours of battery life. External Ports (3) USB 2.0, VGA Connector, Sound & Mic WIN – I have already utilized multiple USB ports simultaneously. I am pleased with the Gateway LT3103u. 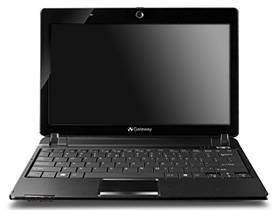 It offers quasi-notebook performance while still maintaining its net book portability. The biggest win for the LT3103u is in ergonomics. Finally a net book for those of us with full-sized hands.